I was on my way back to work from lunch this afternoon and noticed this Doe standing in the middle of my lane of the road. She didn't seem in any particular hurry and seeing a whitetail mid-day just standing there is odder yet. I started to slow so I'd have time to respond whichever way she decided to go when she heard the car as much as saw it and did whatever it is mother deer do to let the kids know now is NOT the time to cross the street. I saw her hop back off the road as I got to be about a 10th of a mile away. When I pulled to a stop alongside her, I was able to see her little ones and the reason for her sluggishness was much clearer. Momma will take all the risks, up to and including dying if it comes to that, for the sake of the young -- pretty honorable when you think about it. I had Weez's little Fuji camera along so I rolled down the passenger side window, turned on the camera and zoomed in as far as it would zoom while mother and kids stood there watching the big gray beast (the car, not me!). 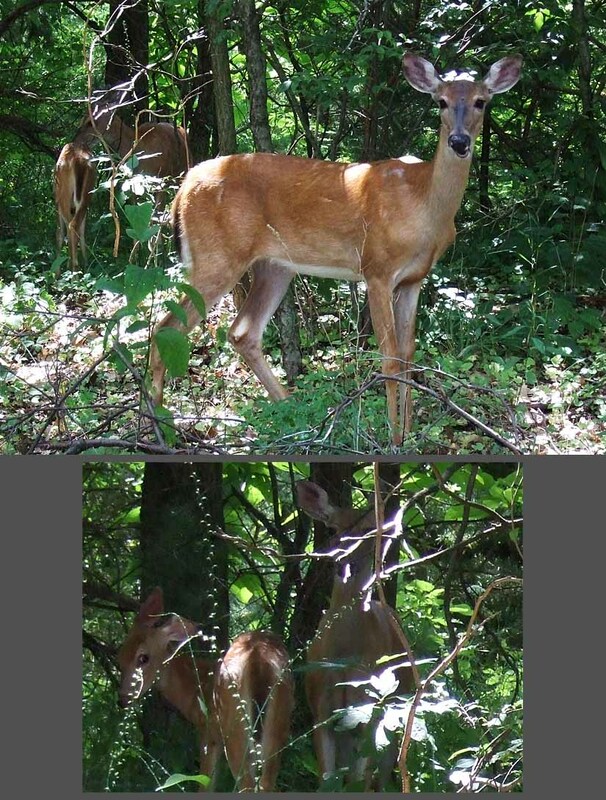 I took two shots -- first the part shown here on top and then another that shows the little ones a tiny bit better. Nice of 'em to pose like that . . .